In 1787, the Royal Navy ship H.M.S. Bounty, captained by William Bligh, set sail for Tahiti in search of breadfruit plants. Soon after leaving Tahiti, Master's Mate Fletcher Christian led a successful revolt, setting Bligh and eighteen of his men adrift. Unfortunately, due to sales rights restrictions, we cannot offer After The Bounty for sale in your country. In 1787, the Royal Navy ship H.M.S. Bounty, captained by William Bligh, set sail for Tahiti in search of breadfruit plants. Soon after leaving Tahiti, Master's Mate Fletcher Christian led a successful revolt, setting Bligh and eighteen of his men adrift. 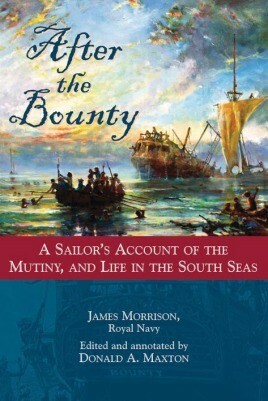 In his journal, fellow mutineer James Morrison recounts the Bounty's voyage from his perspective as the boatswain's mate, placing considerable blame for the mutiny on Bligh's irascible personality and style of command. This event, however, simply introduces Morrison's remarkable journey through the South Seas. A born storyteller, Morrison presents compelling tales after the Bounty mutiny, beginning with ringleader Fletcher Christian's two bloody, ill-fated attempts to establish a refuge on the island of Tubuai. Morrison then recounts his eighteen month sojourn on Tahiti, where he constructed a seaworthy schooner and closely observed every aspect of the island and its way of life. He also includes the subsequent arrival of H.M.S. Pandora, which was charged with bringing the mutineers back to England for trial, and his imprisonment in the horrific"Pandora's Box.” Morrison once again faces peril when the Pandora sinks on Australia's Great Barrier Reef, where thirty-one of the crew and four prisoners perished. Although Morrison did not actively participate in the Bounty insurrection, he had remained with Fletcher Christian's party, which was enough evidence for condemnation once back in England. While imprisoned, Morrison began composing his journal. He was released—King George III granted a pardon—and soon after wrote the second half of the journal, which he filled with detailed descriptions of Tahitian life, culture, and natural history. Morrison's journal is an invaluable resource for naval historians and an enthralling tale for the general reader.